This statue shows the wonderful detail of the police officer and the Indian. Each of the men sit on their horse while greeting each other. This statue sits at the information centre at the Fort Walsh National Historic Site. An open field is their backdrop in the Cypress Hills Interprovincial Park. Statue of Northwest Mounted Police Officer and Indian on horseback at the information centre at Fort Walsh National Historic Site, Cypress Hills Interprovincial Park, Saskatchewan, Canada. 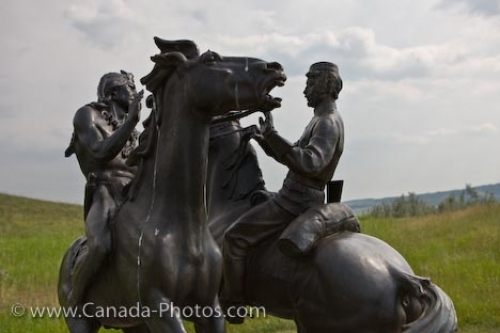 Statue of a Northwest Mounted Police Officer and an Indian greeting each other, Fort Walsh, Saskatchewan.